This book has been sitting around forever and I don't know where it came from. It's a very elderly book, and the spine label is nearly illegible. I had a vague idea that it contained Irish folktales, but when I actually opened it up and inspected it, it revealed itself to be short stories by W. B. Yeats. There are two different collections and then one longish story that is still too short to be a novella. My copy was published in 1914, but this fancier version in the image is from 1927. Stories of Red Hanrahan -- these seem to have been written at different times, all about Owen "Red" Hanrahan, who starts off a young schoolteacher. He gets a message from his sweetheart, summoning him to help her, but first a strange man insists that he play cards for a little while. After playing for hours, Hanrahan wanders out into the mountains and finds a sleeping queen, with four crones holding the four treasures of Ireland. * Like Percival in the Grail quest, he is afraid to ask the important questions, and so he is banished to wander forever, touched by the Sidhe. He spends the rest of his life wandering, sometimes charming women with his words, and sometimes being defeated by them. 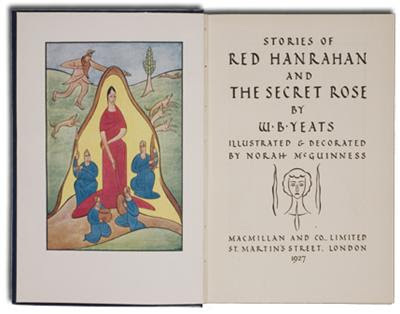 These stories were dedicated to the Irish poet Æ, George William Russell, and Yeats described them as being about "but one subject, the war of spiritual with natural order..."
Yeats got more obviously mystical with the stories in The Secret Rose. It's important to remember for these that Yeats was not just interested in Irish nationalism and folklore; he was heavily into Theosophy as well. These stories are not connected with each other, but they all have a similar tone. The first has a wanderer arrive at a monastery for shelter, but the shelter is terrible, so he makes up a poem satirizing the abbot. The abbot, afraid that the locals will learn the song, comes up with a solution: instead of improving the shelter, the monks put the wanderer to death, as is their habit. Another story has a knight who sacrifices himself for an old man's pigs, for reasons of his own. There is an elderly hermit who has spent his life waiting for the moment when he can become young again by bringing the Men of Faery to his side, a king who grows hawk feathers in his hair, and quite a long story about Proud Costello, who ruins his life and his sweetheart's by his pride. Rose Alchemica is the most mystical of all; it's the story of a man interested in alchemy, and an old schoolfellow promises to initiate him into the Order of the Alchemical Rose. He has many visions of lavish halls filled with dancing pagans, wars between gods and angels, all sorts of things...but like many fairy visions, it turns to dust in the morning. I won't say I understood these stories or anything, but they were pretty interesting. I really only know some of Yeats' poetry and not much of that, so it's good to get some more in. Apparently he got more realistic (in his writing, I mean) later on in life; I guess this was all written during an early transcendentalist period. *As mentioned the other day, in the Elidor post. Curious. The original books are not so long that an excerpted book seems necessary. I do not agree that Yeats became more realistic later in life. See A Vision (1925) for evidence verging on proof. He was always a mix of things. I know little of Yeats work, especially when it isn't poetry.